On the eve of his fourth decade in rock & roll, Grammy Award winning, Rock & Roll Hall of Fame inductee Sammy Hagar has teamed with a seminal array of his legendary rock and country artist friends and bandmates, past and present, for his first-ever rock collaborations album, “Sammy Hagar and Friends”. The release sees Hagar joining forces with award-winning artists including Kid Rock, Nancy Wilson (Heart), Toby Keith, Taj Mahal, Ronnie Dunn (Brooks & Dunn), Michael Anthony (ex-Van Halen, Chickenfoot), Neal Schon (Journey), Chad Smith & Joe Satriani (Chickenfoot), Bill Church & Denny Carmassi (Montrose), The Wabos and more on an epic collection of 10 new songs and unexpected covers. From new original songs including “Not Going Down” (a song specifically written for Hagar by Jay Buchanan of Rival Sons), “Knockdown Dragout,” “Bad On Fords and Chevrolets,” “All We Need Is An Island,” and “Father Sun,” to reimagined covers of classics including Bob Seger’s, “Ramblin’ Gamblin’ Man,” and Depeche Mode’s “Personal Jesus,” – Hagar has masterfully assembled an album that delves into rock, country, pop and blues . 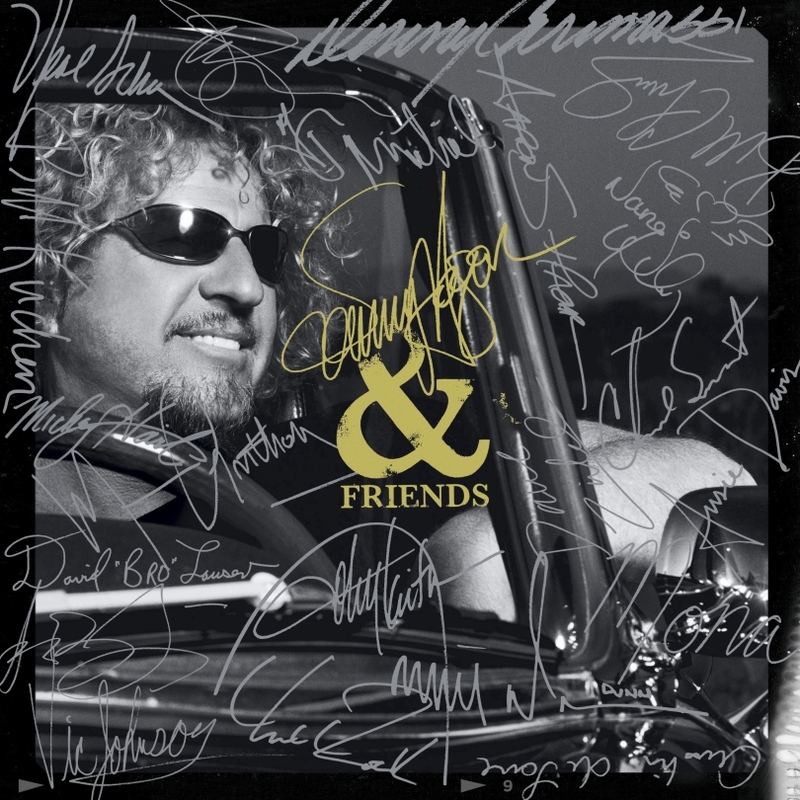 In addition to the 10-track standard edition album, fans will also have an opportunity to purchase a Deluxe edition of “Sammy Hagar and Friends,” packaged in a high-gloss Digipak. The Deluxe CD/DVD package includes an exclusive bonus audio track, “Space Station #5,” recorded live at the Ronnie Montrose Tribute Concert held on April 29, 2012 in San Francisco, as well as the “Making of” album documentary which includes bonus video of the first single “Knockdown Dragout,” and more. I’ll hold my hand up. As a Van Halen fan I love both the DLR and the Sammy Hagar eras. However, my experience of them live has (perhaps unsurprisingly for someone living in the UK) been restricted to the Hagar era. I always enjoyed Sammy’s vocals plus the fact he’s no slouch when it comes to playing the guitar. So much so I definitely prefer the Chickenfoot albums to the most recent Van Halen record (although that isn’t bad). So what about this one? Well it may come as a bit of a departure from Sammy’s work with Chickenfoot and Van Halen in that there is clearly a more blues driven, organic feel to the record (clearly Sammy Hagar is a man comfortable in his work and happier to produce the album HE wants to rather than pandering to record companies or, dare I say it, band egos. 1. Winding Down – with a blues driven, almost swamp laden theme the opening track sees Sammy joined by blues legend Taj Mahal. Dave Zirbel’s dobro shines and the lyrics cleverly commentate on the futilities of modern living – science and technological innovations that never quite “cure” the human condition. 2. Not Going Down – a broody, vintage sounding track with a thoroughly modern twist – clearly reflecting the writing of Jay Buchanon. A somewhat hypnotic riff coupled with almost gospel tinged backing vocals. 3. Personal Jesus – who doesn’t know this one? Such a well known track in it’s original form, “Personal Jesus” has been subject to classic covering in the past, care of Johnny Cash. So can, Hagar put his own twist on this version. In one word … totally. Proving that to truly rock you have to roll, this version is much more uptempo than that of The Man in Black’s and with that makes for a joyous rendition. 4. Father Sun – featuring accordian and mandolin, this could steer very much towards country in the opening bars…then suddenly in licks a guitar sound that fans of Hagar’s previous work will appreciate. Blending a folky style with pure, blues rock … is that the end of the surprises here? Nope …. the guitar solo fashions an almost Eastern (a la “Kasmir”) figure that fits perfectly with the feel of the song. 6. Ramblin’ Gamblin’ Man – proving what a great song writer Bob Seger is. This is a cool version of a fairly straight ahead, rock song. Once again, the backing vocalists contribute to the song by providing a feel that goes beyond the standard – again Hagar is able to firmly stamp his own identity on someone else’s song. 7. Bad On Fords and Chevrolets – joined on vocals by Ronnie Dunn. A neat little song about cars and girls … should rock ‘n’ roll ever be about anything else? 8. Margaritaville – another country (or should that be zydecco?) inflenced song with more than a hint of The Eagles to my ears. Joining Sammy for this one is Toby Keith. Toby is a great vocalist, very much under-rated (some may say, almost unknown in the UK!) on this tune about woment and drinking. Aren’t the simplest ideas the best? This track could too easily turn to cliche, but the quality of structure ensures that, yet again, the song treads that very fine line between cheesy and classy – staying firmly on the side of classy. 10. Going Down (Live in Studio-Take 1) – pretty much a track by ChickenJourney (Neal Schon featured as guitarist). Quite possibly the rarest thing in the universe today ….. a first take making it on to the released version? Totally justified as this is a fabulous song. A crackling burst of grown up (not grown old!) music that allows the Red Rocker to shine the way he does best ….. brightly!